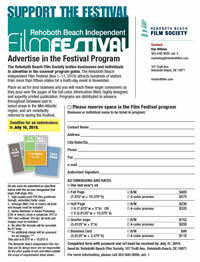 Each year the Rehoboth Beach Film Society encourages organizations to advertise in the program guide. The Festival attracts thousands of visitors from more than fifteen states for a multi-day event in November. Ads reach these eager consumers as they pore over the pages of the full-color, information-filled, highly designed, and expertly printed publication. Programs are distributed in advance throughout Delaware and to select areas in the Mid-Atlantic region, and are constantly referred to during the Festival. Ads are also included in the online edition, available on the RBFS website. Ad sales begin in early summer. July 16 is the final deadline for ad submissions.